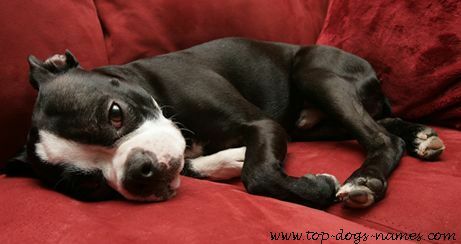 Find A Great Boston Terrier Name + Pics, Meanings & Breed Info. Astral...Begins our list of Boston Terrier names. Atom...For a tiny dog that you will never split from. Bandit...For the most wanted dog. Buddy... A Top dog name. Buster...A home maker--not a breaker. Candy...The sweetest of all dog names. Champ...A top Boston Terrier name. Chum...For your very best friend.. Aaah. Coco...The sweet smell of Chanel. Dandy...Is he smart and likes to be brushed? Dawn...Brought you a new day? Fly...Buzzes here, there and everywhere. Jackpot...That's what you hit when he arrived. Jig...Lively, just like a Boston. Jazzy...Lively and spirited. Joy...Because she is. Katie...A classical female dog name. Meg...And a Cool dog name. Molly...One of my favorite Boston Terrier names. Ozzy...As mad as Mr Osbourne? Puff...For a pup full of energy. Rocket...Well he is almost jet-propelled. Skipper...Well he is in charge isn't he? Call him Skip. Tango...For the dog with fast paws. Tinker...A traveller. And a top dog name. Whiz...Always whizzing about? For a dog in a hurry. Whisky...Almost ends this list of Boston Terrier names. Zest...Bursting with energy. As all pups should be. Zoe...The Greek for Eve. Which means "life". Puppy Training Guide Start Page House-training a puppy. Crate training a puppy. Teaching a puppy to come. Teaching a puppy to heel.